As a deadly weather front continued to make its way across the Southern United States late Tuesday and early Wednesday, both Florida and Alabama were struck with severe flooding that’s left at least one person dead. According to the Associated Press, rainfall in the Florida Panhandle – especially the area around Pensacola – and the coast of Alabama has been relentless, dropping well over a foot of rain in both states. Houses have been flooded to the point where residents have had to seek higher ground, and overflowing roads have stranded drivers waiting to be picked up by rescue squads. In Pensacola, where 15-20 inches of rain fell in a one-day period, at least one woman has been reported dead due to driving in perilously high waters. Florida Gov. Rick Scott has declared a state of emergency in 26 counties. 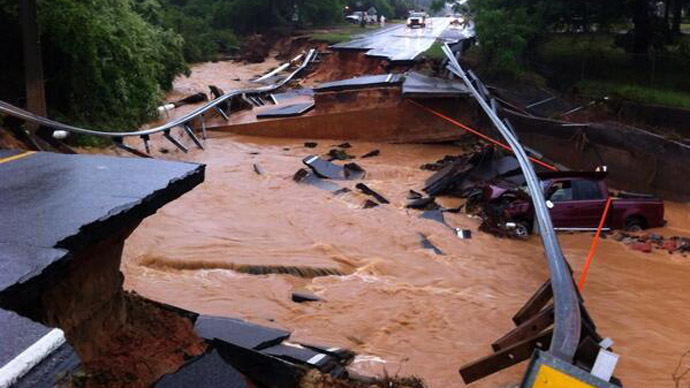 So many people have been calling rescue crews for help that the county has been inundated. The National Weather Service stated that officials are planning aerial rescues and have relocated boats and jet skis from the beaches in order to help as many people as possible. "It's gotten to the point where we can't send EMS and fire rescue crews out on some 911 calls because they can't get there," Escambia County spokesman Bill Pearson told the AP. "We've had people whose homes are flooding and they've had to climb up to the attic." Others, on the other hand, have simply left their cars to seek shelter at their local police stations. "We have people at the police department," added Officer Justin Cooper of the Pensacola Police Department to the AP. "They walked up here and are hanging out until things get better." A similar situation is unfolding in Alabama, where roads are underwater and people have had trouble making it to shelter. According to USA Today, Baldwin County EMA Director Mitchell Sims said the area is being hit with “historical flooding,” adding that calls for help were “non-stop.” Luckily, Sims said, there had yet to be any fatalities related to this particular storm. "As soon as we get a water rescue team in here, they're sent back out," Sims told the Weather Channel. "We're rescuing people from cars, from rooftops, from all over the place. Elsewhere in Alabama, the scene has been likened to that of a hurricane’s aftermath – in Silverhill, weather projections estimated rainfall would exceed what the town experienced during 1997’s Hurricane Danny. At Orange Beach, meanwhile, the storm’s consequences are being compared to Hurricane Ivan from 2004. "We've got water up in our parking lots," resident J.J. Andrews said to the AP. "Our docks are under water. It's worse than during Hurricane Ivan, is what they're saying. It's crazy." The flooding in Florida and Alabama is just the latest surprise to come from a storm system that’s killed dozens of people and spawned tornadoes since Sunday. As noted by CNN, deaths were reported in Alabama, Tennessee, and Mississippi on Monday. On Tuesday, 18 deaths were reported in Arkansas, Oklahoma, and Iowa.